"When I picked up knitting needles for the first time in October 2002, I had no idea that I was jumping on a hot trend that had started to sweep the country after 9/11." Why does knitting occupy a place in the hearts of so many writers? What’s so magical and transformative about yarn and needles? How does knitting help us get through life-changing events and inspire joy? In Knitting Yarns, twenty-seven writers tell stories about how knitting healed, challenged, or helped them to grow. Barbara Kingsolver describes sheering a sheep for yarn. Elizabeth Berg writes about her frustration at failing to knit. Ann Patchett traces her life through her knitting, writing about the scarf that knits together the women she’s loved and lost. Knitting a Christmas gift for his blind aunt helped Andre Dubus III knit an understanding with his girlfriend. Kaylie Jones finds the woman who used knitting to help raise her in France and heals old wounds. Sue Grafton writes about her passion for knitting. Also included are five original knitting patterns created by Helen Bingham. 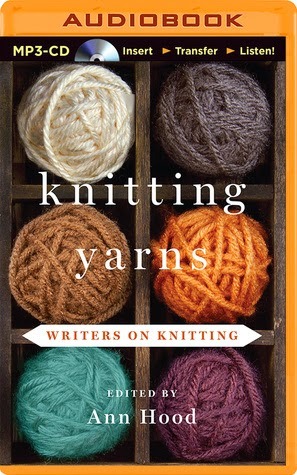 I can say this with absolute certainty: this book would be a wonderful gift for a knitter in your life. How can I say this? Because it was gifted to me by my own sister (thanks, Bethany!)! It's funny, because I am not one to read knitting novels. Occasionally I will pick one up, but although the craft is a passion of mine, it's not something that is enhanced by reading books about knitting groups. Mostly because those tend to be "chick lit" - novels more about the lives of the women in the group than the knitting itself (and chock FULL of awful knitting puns! - and I do love me a good clever pun, normally). And honestly, it makes sense: how much CAN you really write just about the craft of knitting? It'd be boring. You have to write about the lives, or there really is no novel. However, this one (perhaps because it wasn't a novel, but a series of essays) was totally different. It DID make me laugh, and cry, and for sure it inspired me to knit more! I would be listening to the book while walking the dog, and get all eager to arrive back home so I could pick up my needles again. The stories in here are real stories about people who knit, people who wish they could knit, people who simply love being around knitters. They are stories about people who are experts and people who will always find bliss in knitting the most basic of garter stitch scarves, over and over again. It's not a book that judges your knitterly-ness. It is simply a book that celebrates the joys and the emotional power of knitting. I know, I know, how can it be emotional? But the things these people craft with their hands - to make for their loved ones, to make to offer comfort to those who have suffered loss - have truly brought peace to their chaos, in many cases. I loved the story about the mother and daughter who attempted to tackle all of those notorious knitters' banes: the unfinished projects. The ones that you were so gung-ho about beginning, but which got put aside for one thing or another and then languished in your knitting pile for ages - sometimes years. Every knitter has these. Just like every knitter has some sort of yarn stash. They're both something that we almost all have attempted to conquer at one time or another - only to recognize the absurdity of it all. Perhaps there really was a reason you abandoned that piece, be it consciously or not. It's one of the things we just have to accept. There were some great writers featured in this book, too - it was definitely a book specifically of writers on knitting, and you have to keep that in mind. There are plenty of wonderful other stories that could be told, I am sure. These are just the stories that Ann Hood solicited from professional writers. So you get pieces from Barbara Kingsolver, Sue Grafton, Andre Dubus III, Elizabeth Berg, Ann Patchett. All about various aspects of knitting. Not all of the authors even ARE knitters. And I kind of loved that! They still found something very important to write about the craft.